Fabienne Délèze Constantin was born in 1976. She graduated from the University of Geneva School of law in 1999 (lic. iur.). Before, she had studied one semester at the University of Vienna within the framework of the ERASMUS program. From 1999 until 2001, she worked as an assistant at the Constitutional Law Department of the University of Geneva. At the same time, she graduated with a Diploma of Advanced Studies (DEA) in constitutional law. In 2004, after having completed her legal traineeship in a Geneva-based law firm, she was admitted to the Geneva Bar. She continued to work for the next seven years as an associate in the same law firm, specialized in administrative law. 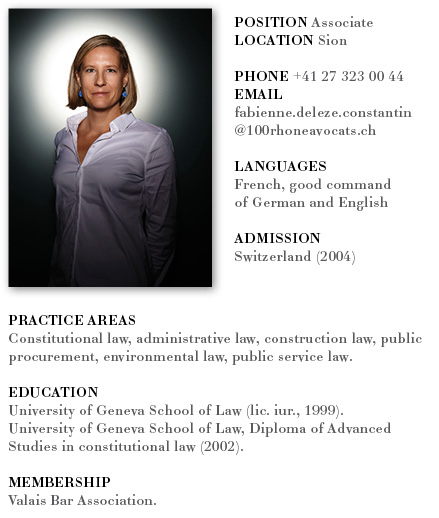 At the end of 2010, she entered the judiciary of the Canton of Geneva, working as a clerk-lawyer until June 2015. First, she worked at the Administrative Court of First Instance, then at the Administrative Chamber of the Court of Justice. In October 2015, she joined the law firm 100 Rue du Rhône Avocats as an associate. Her experience primarily focuses on territory development, construction and public procurement law. Her working language is French and she has a good command of German and English.